Leonard Bernstein's brilliant comic operetta comes to dazzling new life under the guidance of director Lonny Price (A Class Act). Based on the classic Voltaire tale of an innocent young man's journey through a life filled with colorful characters and unexpected life lessons, this tune-filled frolic features Tony Award-winners Patti LuPone and Kristin Chenoweth heading a dazzling cast with Paul Groves, Stanford Olsen, Sir Thomas Allen and the Westminster Symphonic Choir. 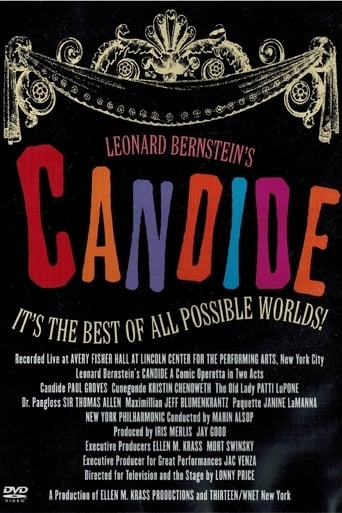 The impeccable score (with lyrics by luminaries including Lillian Hellman, Dorothy Parker, Stephen Sondheim, Richard Wilbur and John La Touche) includes a host of delightful songs such as "Life Is Happiness Indeed," "It Must Be So," "You Were Dead, You Know" and "Make Our Garden Grow." Now enjoy this all-new production of a musical comedy favorite with Broadway's top stars! The final performance on May 8, 2004 was filmed for PBS, which aired the show on Great Performances on January 12, 2005. The same year, a DVD of the concert was released. In 2018, Shout! Factory released the production on Blu-Ray.